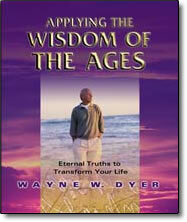 Applying the Wisdom of the Ages – CDs by Wayne Dyer – Discount! Join Dr. Wayne Dyer and travel with him across time on an illuminating search for explanations to the most meaningful questions and important concerns we encounter throughout the course of our lives. You have the power within to speak your truth and create a legacy that will transcend your lifetime. When you connect your life with the profound writings of eras past, you’ll receive an endless stream of insight, information, and wisdom. In these timeless words, you’ll recognize and recall your own hardships, triumphs, and sorrows, and your life will become an expression of the music that lives within you. Apply the wisdom of the ages to your life today. Meet the greatness within you as you connect with the stream of wisdom that is mankind and learn eternal truths that will transform your life.